It's no secret that one of the biggest challenges of undertaking DevOps projects is making sure teams collaborate effectively and communicate throughout every step in the process. In order to leave legacy systems and waterfall strategies behind to focus on agile development practices and DevOps methodologies, it takes all hands on deck. In other words, teams have to be on the same page, or the successful deployment of important projects could be jeopardized. The crucial first step of adopting DevOps is breaking down information silos that have cropped up across an organization throughout months or years of following waterfall development practices. By demolishing these silos and finding ways to communicate effectively between departments, while sharing information freely, organizations can gain the benefits of having an effective, unified team. However, Trevor Parsons, as chief scientist and co-founder at Logentries, stressed in a DevOps.com article that replacing these traditional development and operations silos with teams that are collaborative and communicative is only the beginning. Operations and development teams need to both be on the same page as well, and both need to embrace the new mentality that these agile and DevOps methods bring to the table. Only then will an organization's culture be prepared for the shift. It's important to make sure when enacting any kind of business-scale change to always keep the needs of the employees in mind. This starts with providing high-level support for their endeavors and turning an ear to problems that may arise in each step of the development cycle. Team morale is an integral part of the digital transformation process. The key stakeholder or stakeholders drive change in an organization, and making sure you're visible as a resource for project managers and developers is critical to keeping morale high. "Team morale is an integral part of the digital transformation process." Development and operations teams use specific tools in order to create, test and deploy successful projects. According to SoftLayer, one of the most effective ways to help with the transition from traditional development methods to DevOps is to create a repository for all of the DevOps tools the disparate teams are using. By creating a central place for tools to be accessed, groups can have more agency in the decision-making surrounding these tools, as well. "[A]llowing end users to suggest tools via open forums helps toward recognizing the needs of these end users and, in the process, making them feel more empowered," SoftLayer noted. "This approach also re-emphasizes the more collaborative culture introduced by DevOps. Operations can also be encouraged to embrace this business cultural shift, helping to further support the growth of DevOps." When it comes to maintaining a trusting atmosphere within the development and operations departments, it's crucial that everyone is on the same page in terms of the dev process. But, it's also important to make sure monitoring strategies are aligned. 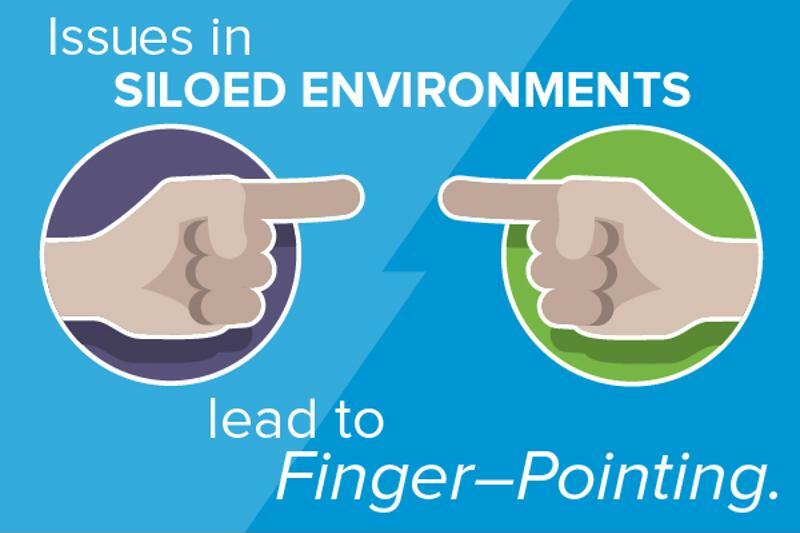 "When issues arise in [siloed] environments, there are as many 'sources of truth' as there are monitoring tools, which can lead to finger pointing and delays as various teams rush to absolve themselves of fault or responsibility," CA Technologies wrote. " And in the cases when these disparate tools do produce valuable data, the onus still falls on operations to collate and triage that information before it can take action and resolve the issue." It's important for the success of these projects that the finger pointing and delays are reduced as dramatically as possible. This in turn strengthens the level of trust between teammates and between developers, testers and executives especially when the chain of command is strictly laid out and strategies are clear. A surefire way to make sure teams are collaborating effectively is to provide them with the right kind of computing environment that engenders this kind of communication. Legacy IT infrastructure doesn't have the capabilities that many app development projects need to succeed — but the private or hybrid cloud offers a fully collaborative environment that facilitates tools like cloud sandboxes and intuitive DevOps methodologies. Many organizations are beginning to make the move toward the cloud. In fact, around 77 percent of enterprises now utilize a hybrid cloud environment, according to the 2016 RightScale State of the Cloud report. In order to bridge that gap between legacy systems and modern infrastructure, there are certain tools that will prove helpful in the long term for organizations looking to enact a culture change based on trust. You don't want to waste time with developers and testers blaming each other when something goes wrong. When it comes to DevOps tools, the do-it-yourself method often falls short of the mark. Migrating data and applications to private or hybrid cloud environments and creating libraries of accessible DevOps tools is all well and good, but it means nothing if your teams don't have the right tools in the first place for successful development. This is where cloud sandboxing platforms like Quali CloudShell come into play. Cloud sandboxing offers a way for all members of the DevOps team to create and use production-like environments for both development and testing purposes. These kinds of platforms allow teams to rapidly spin up the instance, do whatever they need and then reallocate resources without causing unnecessary stress on the system and without taking up resources for drawn-out periods of time. The takeaway: One of the biggest challenges in utilizing DevOps methodologies is making sure the culture within any organization supports this transition. Disparate teams need to come together to work in tandem on important projects, and breaking down silos is only the first step to creating a culture of trust within an organization. By investing in the right DevOps tools, and subsequently making them available to the different groups responsible for project implementation, executives can take further steps toward fostering an effective DevOps culture.